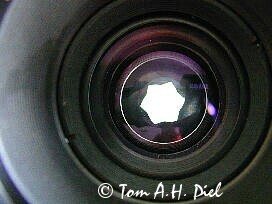 Volna 9 vs Industar 61 L/Z.The Russian Macro Lenses Review by Tom A.H. Piel (Tigers Lair ). All materials written by author permission. There are not much articles on the web discussing the Russian Lenses. Which I personally find odd. Not only are these lenses very good they are also low on prices. So here it is another one in my series of small articles/reviews from just another amateur photographer. Meet the Russian Macro lenses, The Volna 9 (M42) and the Industar 61 L/Z (M42). Okay... so the Industar 61 L/Z doesn't have macro printed on. It is in fact a standard 50 mm lens with a twist, it comes very close, a lot closer than any of the Helios lenses. Pherhaps there are more Russian macro lenses around. I don't know. I'm not counting the Helios 44-2 as a "true" macro lens, because it focusses down to only 45 cm. There are also some 300 and 500 mm mirror lenses around from Lzos and Rubinar around marked with Macro but I have no experience with them nor have I ever seen them in the Netherlands. The Volna 9 big lens, 2.8/50mm multicoated, focus range down to 20 cm and up to infinity. If we take the well known Helios 44-2 2/50mm as comparison than the Volna is a bit bigger. The front element is deep down in the lens which means you don't need a lens hood. It takes 52 mm filters. It has no autoaperture pin. It is a preset lens lens. At a glance it doesn't seem to have any clickstops but if you push down the front ring it works the same way as the Helios 44-2. You push down and lock it too the required aperture. Then you can open the lens focus and close it to the preset aperture. Pricerange, 50 to 80 dollars or 55 to 90 Euros. Bottomline, Both lenses are equally sharp but the Volna 9 just gives you that little extra edge in macros. Both lenses have the same features, both are preset, sometimes a bit awkward to use due to the grease that stiffens up from years of neglect, which happened to mine. Both are Multicoated. The Volna 9 has more lenselements than the The Industar 61 L/Z and is a bit sharper than the The Industar 61 L/Z but not by much. Both share the odd starshaped Iris. For general macro use, flowers, animals and stuff the The Industar 61 L/Z can't be beat for the price. If you have the cash and don't mind the bigger Volna 9 you will get an excellent macrolens for any field use. But the big winner is the Industar 61 L/Z, the little big lens. Price quality wise it is just excellent.